Every gardener’s favorite time of year has finally, officially, arrived. The season we’ve been anticipating and planning for since fall. It’s spring! New growth is showing up on spring flowering shrubs and ornamentals, including roses. Take some time to examine the new growth on your roses closely. Are the leaves that are coming in small and distorted? Have the new shoots grown so quickly they are spindly? If your answer is yes, or if you’re not sure, it’s possible that your rose has rose rosette disease (RRD), which is showing up in our area. RRD is caused by a virus or a virus-like pathogen that has yet to be identified. Because of this, there are no tests to positively confirm the existence of RRD in a rose. The disease is known to be transmitted by the eriophyid mite or by grafting a diseased cane onto a healthy plant. Unlike aphids, which you can see covering new buds by the dozens, the eriophyid mite cannot be seen by the naked eye. While there is not a test to confirm the existence of RRD, the disease has several noticeable symptoms. One of these symptoms is the rapid elongation of new shoots, followed by development of witches’ broom or clustering of small branches. In witches’ broom, the leaves are small and distorted and may have a red pigmentation. Be aware, the red pigmentation is not a consistent symptom. Canes can develop excessive growth of unusually soft and pliable red or green thorns. They may also be noticeably thicker than the parent cane from which they stem; and the canes may grow in a spiral pattern. Flowers are generally distorted and have fewer petals than normal. In addition, the color of the flowers may be different. Buds may abort, be deformed, or be converted to leaf-like tissue. When all of the above symptoms are present, the diagnosis is straightforward. However, it is possible that a diseased plant will not exhibit all of these symptoms at once, especially in the early stages of the disease; and by the time the symptoms are recognizable, the disease is likely to have spread to neighboring plants. The wild multifora rose (Rosa multiflora), which can be found growing in ditches along the side of the road or in untended fields, is very susceptible to RRD and has been known to spread the disease to roses in its vicinity. However, rose gardens in the city are also susceptible because the eriophyid mite is blown in by the wind. 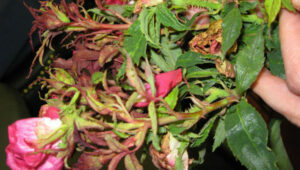 While R. multiflora is the species that appears to be most susceptible, many other rose species are highly susceptible. There is not a cultivar on the market that has yet proven to be resistant to the disease. Unfortunately, there is no cure or effective control of RRD. Early detection of the disease is the key to effective cultural control. If you are not sure that a rose in your garden is infected, monitor it closely for continued symptoms and immediately remove and destroy the plant if a positive diagnosis is made. To dispose of a diseased plant, cut it back and dig it up. If burning is permitted in your area, this method can be used to dispose of the diseased plant. If it isn’t permitted, put the plant in a bag and dispose of it with the household garbage. RRD is not soil-borne, so it is possible to successfully plant healthy roses where a diseased plant was. However, if you do plan to plant a new rose in place of a diseased rose, remove some of the old soil, root pieces and old leaves and flower petals from the area. Several resources, including the Virginia Tech Cooperative Extension, have recommended the use of Sevin and Avid. However, these resources also state that Sevin is not an effective control due to its inability to provide adequate coverage and Avid can only be administered by professionals. If you are a rose grower, or considering growing roses, don’t let a fear of this disease deter you from cultivating such a beautiful flowering plant. With care and early detection, many of the pests and diseases that affect roses can be controlled, leaving you with beautiful flowers to enjoy all summer long. For more information on rose care, pests, diseases and maintenance there are hundreds of websites on the Internet to check out including: Virginia Cooperative Extension at www.ext.vt.edu, The American Rose Society at www.ars.org, or The Shenandoah Rose Society at www.shenandoahrosesociety.org.